(Chuck Muth) – OK, are you ready for an absolutely unbelievable Thanksgiving story that’ll melt your heart? I left the house yesterday around lunch time to take my 16-year-old daughter, Kristen, over to her boyfriend’s house. We got about two blocks away when we both noticed a little white dog wandering up the street coming towards us. This is not an unusual occurrence for our family. 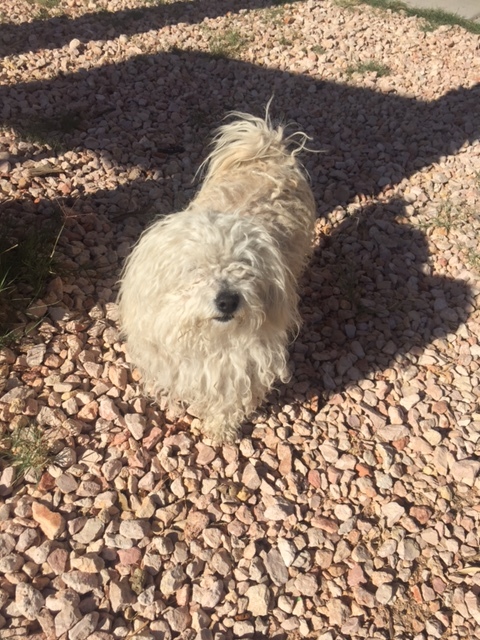 I can’t tell you how many times we’ve corralled a wayward dog and either re-united it with his/her family thanks to a dog collar or micro-chip, or adopted out the dog, or turned it over to a rescue operation – or in the case of “Snowball,” made him a part of the Muth clan. So naturally I pulled over to the side of the road. Kristen jumped out to try to coax the dog to her. But, no joy. The dog just kept running in the other direction. 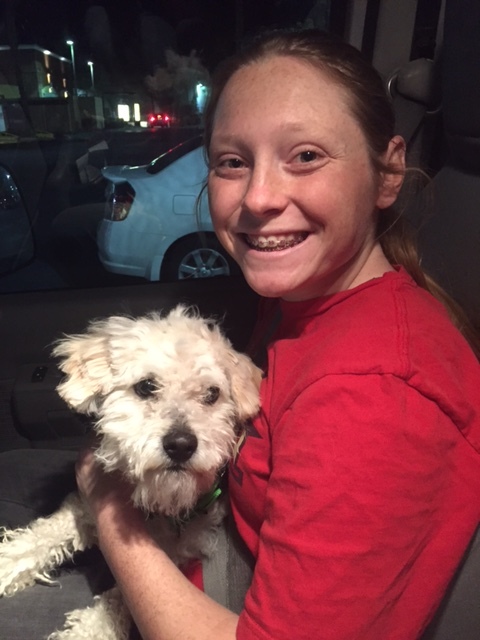 So it was time to call our own in-house “dog whisperer” – my 15-year-old daughter, Jenna. I turned around to go back and get Kristen and, wouldn’t you know it, by the time we found Gia and Jenna, Jenna had, indeed, coaxed the dog into the car with her. It’s an amazing thing to behold. Jenna just has a heart of gold and a unique way with animals. And the animals seem to sense it about her and trust her. So Kristen and I go on our merry way knowing Jenna and Gia know the drill and will take things from there – look for the name/number of the owner on a collar and, if no collar, take the dog to PetSmart to see if he’s micro-chipped. I know. The story seems kinds of mundane so far. But stick with me. It gets MUCH better. I promise. 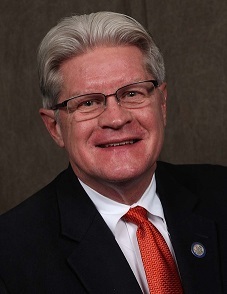 I run my chores – including stopping by my lawyer’s office to sign an affidavit for a lawsuit we’ve filed against the State of Nevada (OK, so there is a *little* politics involved in the story) – and return home. The little dog is inside our fenced yard – which is not a good sign. That likely means no collar/no chip. And sure enough, Jenna tells me that’s the case. Gia has already posted an “all points bulletin” on the neighborhood chat forum, and it’s time for me to print up the requisite “Lost Dog” posters. By appearance, the dog had probably been running around on the street for a long time. This little guy could be a poster boy for “mangy mutt.” He looked like a miniature albino Chewbacca. The dog’s hair was so long and so matted that it looked like he was wearing dreadlocks. You couldn’t even see his eyes. And the fur was so thick under his belly that it was soaked in urine. So if he was going to be staying with us for a few days while we tried to find the owner – a longshot, at best, since he had no collar or chip – he HAD to get cleaned up. 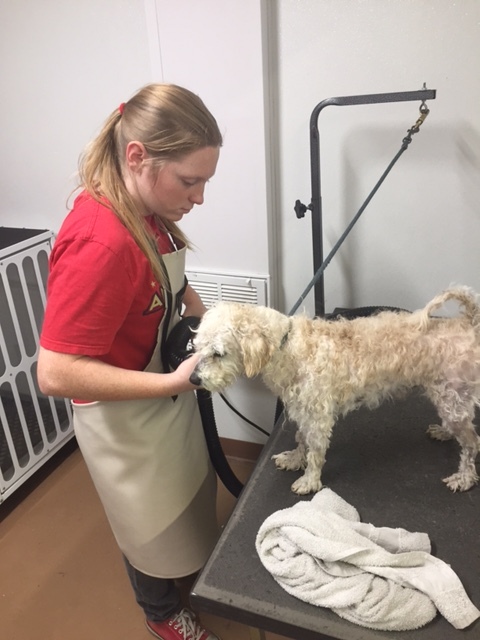 However, all of the professional dog groomers Jenna called refused to take care of him unless we could provide proof that he had his shots. Which, of course, we didn’t have since we rescued him off the street. So to the Internet I went in search of a self-serve dog wash. The closest one I could find that was still open on Thanksgiving eve was about a half-hour away on the other side of town. We loaded up Stinky in the van, stopped off at PetSmart to buy him a collar, and headed to The Soggy Dog in Henderson. It was a guy named Daniel, who happens to be married to our kids’ former babysitter, Nicole. Nicole lived about two miles from our house and babysat our kids when she was in high school. Now she and Daniel have two little kids of their own and moved over to the other side of town. We explained the situation to Daniel, who informed us that Nicole was thinking of getting a dog. Naturally, I *helpfully* suggested that Stinky would be a GREAT dog to adopt. He actually seemed to think this might be a possibility and said he would tell Nicole when he got home. But that’s not the unbelievable part of the story, although it was a heckuva coincidence. We wished each other a Happy Thanksgiving and Jenna and I took Stinky inside for his bath. Now, neither Jenna nor I have ever given a dog a haircut. But it was absolutely required in this case. 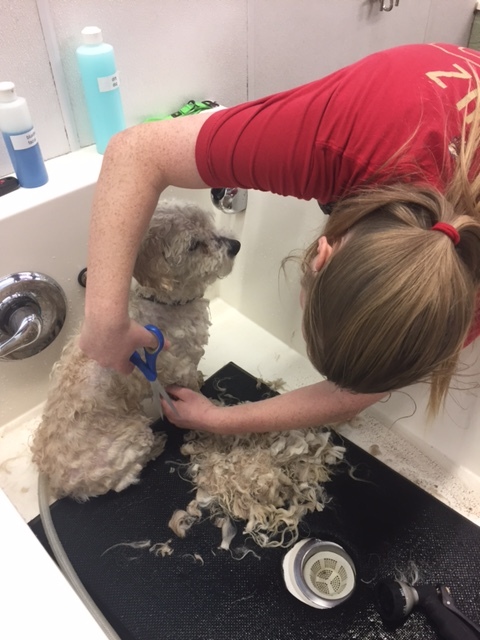 Stinky’s fur was so long and so matted that it was impossible to brush it out. Then again, the dog was so mangy-looking we figured we couldn’t do any worse. So we started. A snip-snip here; a snip-snip there. And an hour-and-a-half(!) later, we were finally able to actually wash the poor thing. Now, this exercise wasn’t without a little trepidation. 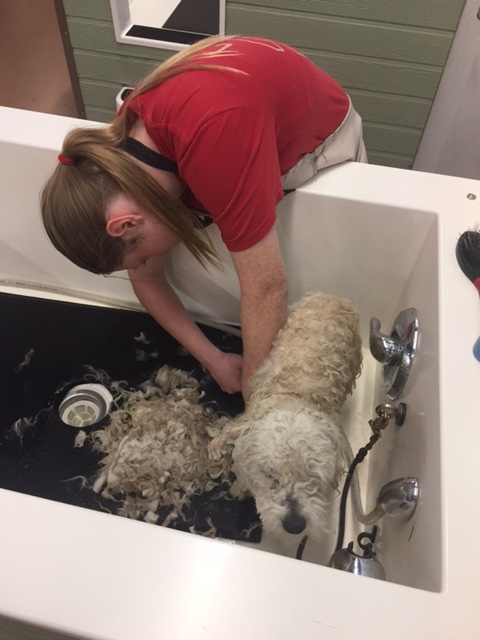 We didn’t know this dog and had no idea how he’d react to getting a bath and a haircut. There was, of course, the possibility he might bite us and we had no idea if he had his shots or not. Stinky allowed us to hose him down and didn’t move a muscle during the entire ordeal – other than the one time I nicked him with the scissors, at which point I turned the scissors back over to Jenna! I know. It’s gotta be one of the WORST haircuts ever! But it’s a heckuva lot better than what he looked like going in. 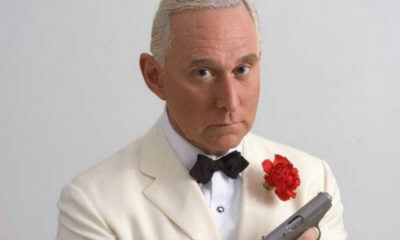 I mean, what are the odds that we’d run into him on that side of town at exactly that time at exactly that place? Anyway, he went home and told Nicole about the dog we’d rescued. And Nicole texted Gia and asked if she had a picture of the dog. Gia sent her the picture she’d take before Jenna and I headed to The Soggy Dog. You see, as it turns out, Nicole had a little white dog, “Baby,” two years ago while she and Daniel and their newborn son were still living at her mom’s house on our side of town. Apparently, her mom took the dog’s collar off when she tried to give him a bath one day and somehow the dog got out. They never found him. No way, right? Impossible. What are the odds? I mean, it was TWO YEARS ago! Jenna looked but didn’t notice any spots on his belly. Then again, he still had a lot of fur since we didn’t want to trim too close to the skin. Nevertheless, Nicole and Daniel and their two kids drove over to our house to check him out. Which had tears of joy streaming down them! Still, it’d been two long years, and Nicole wasn’t 100% sure it was Baby. So we lent her a leash and they drove down to her mother’s house. Apparently Nicole’s mom had taught the puppy some kind of trick when they had him – and the little dog performed the trick on command. Seriously. What are the freaking odds, right? Oh, the stories I bet that dog could tell. Anyway, Nicole and Daniel had plans to visit Daniel’s family in California for Thanksgiving weekend. So we’re babysitting Baby while they’re gone and will take him to the vet tomorrow for his shots and to get him micro-chipped. 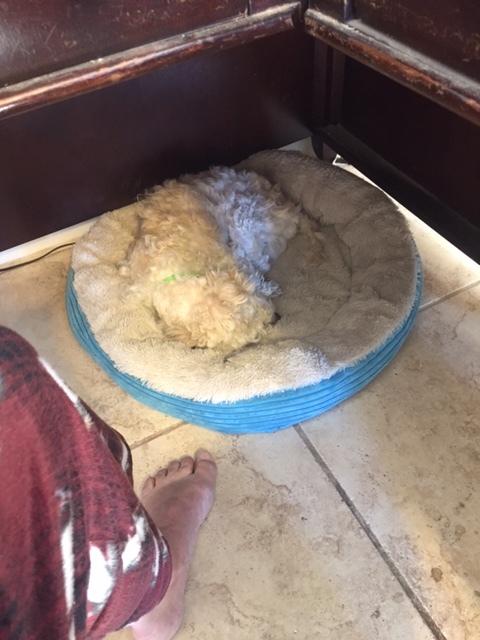 As I’m writing this, Baby is curled up, sleeping at my feet under my desk. He has a lot to be thankful for today, that’s for sure. Lord, how I love a happy ending! 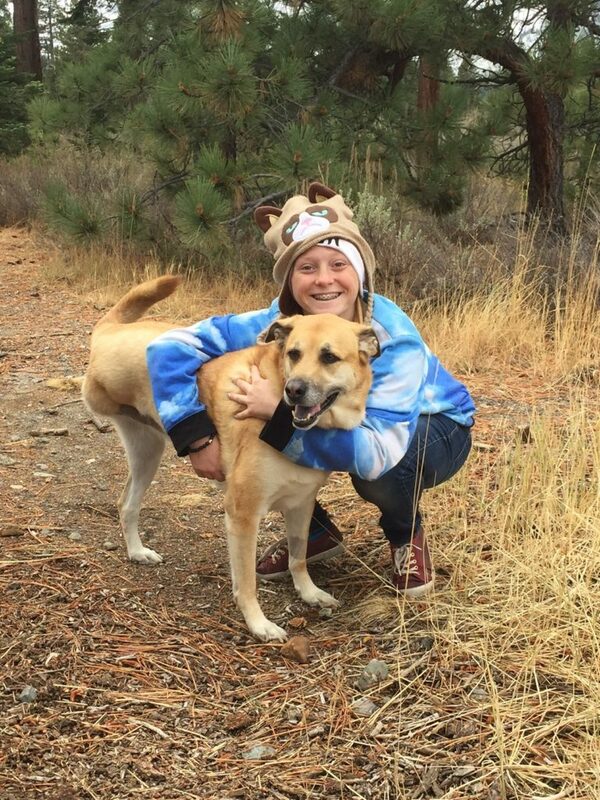 As you’ll recall, Jenna’s dog, Prancer, was diagnosed with cancer in her right hind leg back in August. Thanks to many of you, Jenna was able to raise enough money through GoFundMe to pay to have the leg amputated and undergo chemo treatments in the hope of stopping the cancer from spreading. I’m happy to report that Prancer (who I’ve since nicknamed “Tripod”) has fully recovered and completed her chemo – with no sign that the cancer spread! With any luck, Prancer will be with Jenna and our family for many years to come.